Typical fan motor controls are on-off for a single speed motor, high-low-off for a multi-speed motor, or infinitely variable speeds, from 0 to 100%, for a motor connected to a converter. The number of cooling tower cells, the sophistication of the system controls, and the cost will dictate the selection of fan controls; however, the most fan-energy efficient control option is the converter. The use of a converter on a cooling tower fan is also the most sensitive means to control leaving water temperature on critical process water applications. The cost and functionality of state-of-the-art PWM converters makes them a very attractive control option for owners and operators of cooling towers to save energy and reduce noise in non-peak periods. The use of frequency converter technology can also benefit the life of the mechanical components with fewer starts, smoother starts, and built-in motor diagnostics. Frequency converter technology has particular benefit on towers working in cold climates where airflow can be modulated to minimize icing and reversed at low speed for de-icing cycles. As with any technology, improper customer expectations, poor specifications and bad installation practices lead to problem frequency converter applications. Successful frequency converter installations cannot be made casually, all applicable frequency converter, motor and tower manufacturer recommendations, in addition to local electrical codes and best electrical grounding and conduit practices must be strictly followed. On July 7, GoHz announced that all equipment whose motors will be driven by frequency converters must be provided with inverter-duty motors in order to maintain the motor warranty. Motors utilized in frequency converter applications are not covered under warranty by either the motor manufacturer or GoHz unless inverter-duty motors are supplied. The power supplied to the motor by a frequency converter is not smooth. 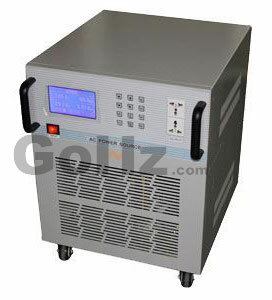 The inverter within the frequency converter takes the 50 Hz power then chops and re-shapes the AC sine wave. This simulated AC voltage contains spikes and irregularities that must be absorbed by the motor windings. Frequency converter duty motors are built with heavy-duty windings and are equipped with extra heat dissipation features to handle the frequency converter application. In addition, spike resistant wire is utilized in our inverter duty motor design. The type of motor, manufacturer of frequency converter, motor lead lengths (between the motor and frequency converter), conduit runs and grounding can dramatically affect the response and life of the motor. Regardless of motor supplier, minimizing motor lead length between the motor and inverter is good engineering practice. Although motors have a 5 year standard warranty, this does not mitigate the reality that running a motor on a frequency converter will reduce bearing life. Motors running in frequency converter service are more susceptible to bearing failure due to the high frequency switching and transient voltage spikes formed between the rotor and stator. An option is available (albeit an expensive one) for insulated bearings to protect the bearing from these shaft currents. Maximizing fan energy savings at the cooling tower does not always maximize total cooling system energy savings. In many cases, running a fan at full speed and driving the condensing water temperature from the tower to the lowest temperature will save more net system energy at the compressor. This savings is more than what can be realized at the cooling tower fan motor. Process cooling systems are generally where tight capacity control is required, and frequency converters make the most sense. However, most HVAC applications do not require the strict capacity control found in process cooling systems. It is more common to use 2 speed motors or multicell cooling towers with single speed motors. Two cell cooling towers with 2 speed motors can have 6 stages of capacity control. The Two-Speed control panel will be less expensive than a converter for the same application. NOTE: System flow rate must not fall below minimum flow requirement for each cooling tower/cell. Maximum fan energy savings is realized by running all fans at the lowest possible speed to maintain the desired cold water temperature. On multiple fan tower systems, all of the converters should be synchronized to speed up and slow down uniformly. When different motors are each on a separate frequency converter control, the fans tend to ramp up and down, often fighting one another. This creates more continuous acceleration/deceleration forces on the fan blades and odd airflow/static patterns that fatigue the fan blades. The converter needs a pre-set shut off speed to prevent water temperatures from becoming too cold and to prevent the frequency converter from trying to turn a fan at near zero fan speed. At extremely low speeds with high inertia cooling tower fans, frequency converters will suffer nuisance trips on over-current conditions. Because of the increasing number of frequency converter applications, the question of capacity and power consumption at low fan speed is frequently asked. For estimating purposes, the unit capacity drops off linearly with fan speed and fan power is reduced by the cube of fan speed. For example, if a unit produces 500 tons with a 50 hp fan motor at full speed, it will produce 250 tons at half speed. According to the fan laws, the unit will draw (.5)3=.125 x 50 HP=6.25 HP. Due to inefficiencies at low speed the motor will actually draw 7.5 HP. (15% instead of 12.5% of full speed nameplate hp). During free cooling and winter operation, ice may develop in the cooling tower. On induced-draft cooling towers, a reverse mode can be applied to de-ice the cooling tower. The frequency converter supplied on such projects should be designed with a reverse mode. The reverse mode must be locked out to work at or below 50% of motor rpm only, any higher fan speed may damage the fill and eliminators. Also, during free cooling/winter operation mode, the tower fan speed should be ideally set to cycle between 50% and 100% fan speed. Running below 50% fan speed may allow water to come into contact with the inlet louvers and start ice formation. It is NOT possible to run the centrifugal fan in reverse for de-icing. For these applications, it is essential to have a frequency converter that is programmed to run down to 10% to allow the fans to always work and reduce the possibility of splash-out and condensation on the fans, which lead to ice buildup. Frequency converters can have a negative impact on the mechanical performance of gear drive systems. There are many frequency converter suppliers in the market, and certain manufacturers converters create gear cogging and "chatter" at non-specific running frequencies. These frequency bands vary with each frequency converter supplier and it is necessary for the frequency converter supplier to lock out these bands so that the cogging is eliminated. This is not a Cooling Tower manufacturer's operational concern, but a normal system start-up routine. We have strived to identify those suppliers with the best electronics that eliminate these cogging issues. In addition, we have tried to evaluate their design, but obviously due to competitive and proprietary reasons, we are unable to unlock the specifics of their design. Please contact the GoHz if you have any question about your frequency converter supplier and design. 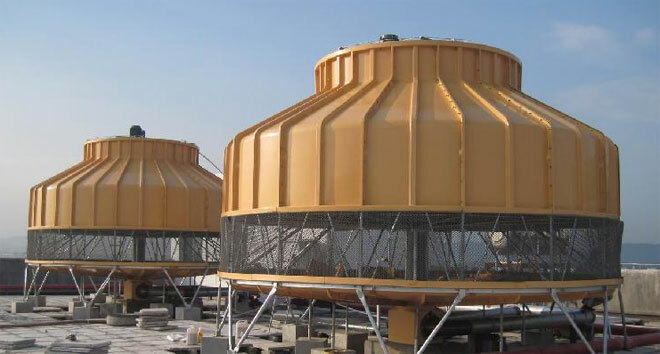 Many cooling towers are specified with commercial grade HVAC frequency converters because the tower is considered a simple device. Always specify Industrial Grade converters, it will be a better converter and is usually designed to handle gear back lash, fan inertia, drag and coupling stiffness. As mentioned before, if the frequency converter control scheme allows low fan motor rpm operation, there will be a concern that the gear box is not receiving adequate lubrication. 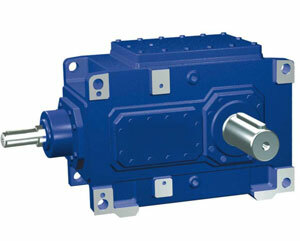 The standard gear box is lubricated properly down to 450 motor input rpm. Below 450 rpm, or 25% speed, oil cannot reach the upper output shaft bearings, therefore a gear box designed to operate below 450 rpm as standard is required. The information just presented provides the ground work for frequency converters and Cooling Tower Applications. This next section provides the details of applying a frequency converter in the field. Fixed speed fan systems are designed to run resonance free at their prescribed running speed. Frequency converter systems can work at all speeds from zero to full speed, creating the opportunity to strike a multitude of previously avoided system resonant frequencies. This may lead to unit vibration, fatigued structural components or gear noise. Further, all motor windings vibrate at 2x the power line frequency creating three simultaneous but variable excitation frequencies in the rotating equipment – one at fan running frequency, one at motor running frequency and one at 2x line frequencies. Modulating frequency converter systems will strike every forcing frequency from 0 to 2x line frequency (0 to 100 or 120 Hz). Large structures (tower and building) inherently have low natural frequencies, within this working range. Owners and operators must expect that there are frequencies that must be locked out to prevent drive system and structural damage and noisy operation. As part of the installation, resonant frequencies should be determined and locked out in the frequency converter's software. Not all resonant frequencies can be determined in advance because the tower's supporting structure, external piping and accessories contribute to the overall stiffness of the tower. Discovering resonant frequencies in a running cooling tower does not necessarily indicate a cooling tower design defect; but rather, a failure to perform appropriate systems checks. This may cause premature equipment failure. The frequency converter must also be adjusted so that the tower's fan drive train does not experience cogging or torque ripple. These torque fluctuations can occur at various frequencies over the running speed range. If the cogging cannot be controlled with programmable frequency converter settings, the frequency converter should be programmed to skip the troublesome frequencies. To check for other troublesome resonances in the field, a run-up and run-down test needs to be performed. Starting with the lowest working frequency, step up fan frequency about 2 Hz at a time until full speed is reached. At each step, pause long enough for the fan to reach steady state. Note changes in unit vibration. Ideally, an accelerometer mounted on the bearing plate should be used to monitor the vibration levels. However great caution must be exercised with accelerometers. They are highly susceptible to electrical noise from the frequency converter, which creates both random and periodic spikes in the vibration spectrum. If a "rough" or loud working condition is encountered, quickly skip frequencies until the condition subsides. Note the beginning and ending band of the rough frequency range. Continue stepping through frequencies until full speed is reached. Repeat this process in reverse by stepping back down the frequency range to minimum speed. Some frequencies not detected on acceleration will arise on deceleration. Isolate the troublesome spots and approach them carefully from the top and bottom to try to determine the "edge" of onset. After the problem frequencies have been identified, a 2 Hz safety band on either side should be added and the frequency band programmed into the frequency converters lockout. If a vibration problem is noted over a very wide frequency band (10 Hz or greater), there is likely a problem with the frequency converter or the mechanical equipment. The frequency converter supplier needs to be consulted. Often alleviating the problem is as simple as correctly programming the frequency converters torque profiles, carrier frequencies, and smoothing parameters. Persistent problems need further attention from the motor and frequency converter manufacturer. Motor noise or whine can be a serious problem with frequency converters in sound sensitive locations. Frequency converter driven motors normally exhibit a sharp tonal noise somewhere in the 2-8 kHz band that is 5-10 dB higher than the background sound levels. The noise does not indicate a motor problem. The noise is a consequence of the frequency converter's high frequency power switching. Most frequency converters have programmable carrier frequencies or tone controls that allow some motor noise reduction. A higher carrier frequency reduces the audible noise but also reduces the current capability of the frequency converter and increases the voltage spikes in the motor. The frequency converter should be field programmed with the lowest tolerable carrier frequency for maximum frequency converter and motor life.